ONE BENEFIT from playing over a period of time is gaining a better understanding of your game. It's an important in your development as a player to try to stay objective and clearly identify where you excel and where you might need some work. When you really know your game, you can make the correct choices that will (hopefully) lead to the best results. For example, how do you decide when to play safe and when to attempt a difficult shot? I've seen some players avoid straight-in shots to play a safety because they were overcome by the fear of missing. I've also seen plenty of players think they were invincible, so they would try to make the most difficult shot when a safety was readily available. For situations where you're torn between offense and defense, I've developed something I call "The Honesty Rule." This concept means you have to be completely honest with yourself, because nobody has more experience with your game than you. Let's look at two approaches to the same situation as an example. 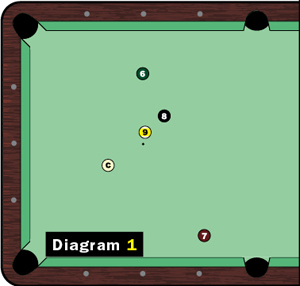 In Diagram 1, you are on the 6 ball in a game of 9-ball. Say you think you can make the cross-side bank half the time. But you could play a very good safety 80 percent of the time. In this case, you have to play the safety. Of course, there is a point at which you have to go for it, no matter how easy the safety. There is a value to staying at the table. One thing that I've learned is that one extra turn for your opponent can lead to you losing the game or match. When you're at the table, you're in control, so you should go for it when you can be successful 80 or 85 percent of the time. With some experience, you'll begin to see when you should go for it and when you should play defense.